University of California President Janet Napolitano joined UCLA first-year students in a seminar, discussed an array of issues with student leaders and met with faculty and senior administrators today during her third visit to a University of California campus since taking office less than two weeks ago. Her meetings at UCLA began barely 12 hours after she concluded a day-and-a-half visit to UC San Diego, where she discussed student issues, scholarship and research with faculty, students, staff and university supporters. "I’m here to listen and learn," Napolitano said after her lunch meeting at UCLA with 22 undergraduate and graduate students. "I am committed to being a strong advocate for higher education and keeping this system as the lodestar for what public education ought to be." She made an impromptu visit to the Bruin Resource Center, which offers services supporting student veterans, undocumented students, current and former foster youth, students with dependents and transfer students. In the morning, she was provided an overview of what Chancellor Gene Block calls the "elegant balance" — the blend of hard science, arts, athletics and public service — that has made UCLA the most-applied-to university in the nation. Immediately after that briefing, she participated with 20 students in a Fiat Lux freshman seminar with 12 students, discussing "Real Stories Behind Supreme Court Indian Law Cases." Among the dozen students in the seminar were California resident students, international and domestic out-of-state students, including a Native American from the Pascua tribe in Arizona. The seminar — taught by Carole Goldberg, vice chancellor for academic personnel and the Jonathan D. Varat Distinguished Professor of Law at the UCLA School of Law — is based on a 16-chapter book of narratives (rather than just legal doctrine). The students study 10 chapters over 10 weeks for the one-unit course. 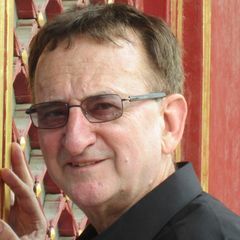 Goldberg selected the chapter discussed today because it focused on an 1886 case that arose in California and involved the issue of federal jurisdiction over criminal cases on American Indian reservations. It also was a way to welcome Napolitano back to California, Goldberg said. Napolitano, a former U.S. attorney and attorney general of Arizona, talked with the students about some of the challenges of establishing where a crime had been committed to establish federal jurisdiction. If it was determined that the crime did not occur on Indian land, only the state could prosecute. Napolitano gave some detail and background on why a state might not prosecute. "This was not just her as an observer," Goldberg said. "She really contributed to the class discussion, from a very rich and valuable set of experiences." At UC San Diego, Napolitano learned about various research initiatives, including brain mapping and the interaction between the ocean and climate. She engaged in presentations about interdisciplinary studies of art, architecture, archeology and imagination, as well as engineering and the university’s health sciences and services. She was briefed by Chancellor Pradeep Khosla and others about future plans for a campus that has become an internationally celebrated research powerhouse just a few decades after its creation. She met with leaders of the Academic Senate at both UC San Diego and UCLA. 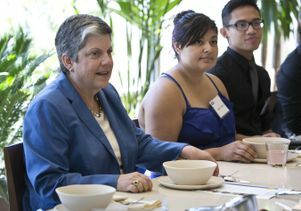 Among other topics discussed at those campuses, Napolitano addressed her stance on immigration issues related to UC, emphasizing that her focus is on supporting the aspirations of all students, documented and undocumented. UC President Janet Napolitano visited with students at UCLA.